Does Your City Maintain Bike Lanes? My city maintains on-road bike lanes about as well as they maintain the roads. Crap roads have crap bike lanes, nice roads have nice bike lanes. There's some problems getting money for either, as the State DOT is prioritizing new construction over maintenance of existing streets; one main street is now nearly impassible without at least a gravel bike. One exception is the winter. 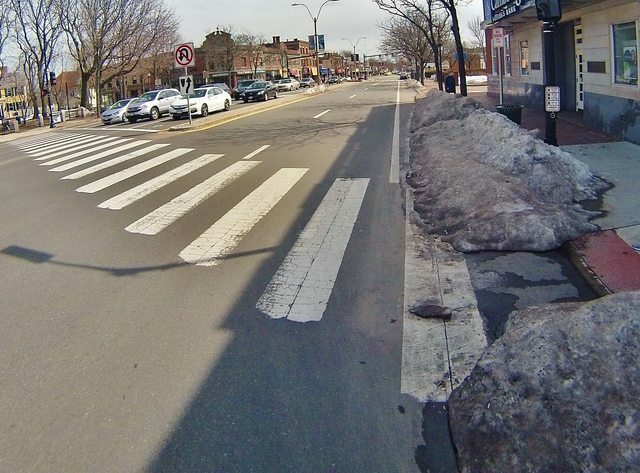 When main streets get plowed, bike lanes become snow storage. So if you want to go places, you're on your own to share the road. What's especially odd about this is that the paved bike trails - of which some go useful places, and others are just fun nature trails - seem to get plowed before the roads. I'll take it, though. The city doesn't maintain bike lanes here. That is Oregon DOT's job. Albuquerque does an okay job. Anyone here from Florida? I've always been impressed when visiting the state and look foward to riding...even if it's a rental. I suppose fine weather bennifits nice roads and paths with no winter. The last mayor, Richard Berry, made it an issue (even though a Republican). They added underpasses on the trail along the Northern Diversion Channel so it goes under Menaul, Candelaria, Springer, Osuna, and Paseo del Norte and an overpass over I-25 in Bear Canyon, one over I-25 in the Domingo Baca wash. There's a 50-mile trail around the city. I've bicycled through Gainesville (on my way from Iowa to Key West); I thought it was especially bike-friendly. Interesting side note -- on some of the streets along my commute through Oakland there are No Parking signs which restrict parking during certain days to allow for street sweeping. Many times I've seen cars violating the restrictions for that day with the resultant parking ticket flapping in the breeze. I've NEVER seen a street sweeper on those same streets. Never. Nor is there any evidence a street sweeper has EVER passed through some of those same streets. Just sayin', ya know? No love for the 'hood? Oh wait, there are plenty of clean streets around the city admin buildings. All our cycle lanes are also footpaths, and i suppose this helps in the maintenance. Broken glass for example is cleared up very quickly (probably reported by dog walkers). But the whole system is completely isolated from the roads, so quite a lot of it has mud, leaves, and some areas have damage to the surface by tree roots underneath. My town, about 30k (I think, haven't looked at the population data in quite awhile), has decent bike/walking paths through several areas of town, but those only can take you to the general area of where you are going. For actual cycle lanes... Well, they painted bicycle icons on several roads demarcating a 'bike path' on the road but that is literally all it is, just the original road with a bicycle icon painted near the side. Pretty pointless. Schertz, where I live, has no bike lanes. New Braunfels, where I work, has a number of bike lanes that were paid for with federal money. They're great for parking or putting out trash cans. The ones in the middle class and upper class areas are at least maintained; the ones on the poorer side of town are more poorly maintained than the streets. But San Antonio and Austin maintain their lanes fairly well. Happy to report that in Cleveland, Ohio new bike lanes are maintained, would like to see more users though. They even put up signs indicating bike may use full lane. Motorists comply. Change will be slow and it has started here. Bike lanes is a misnomer. Most are Called that but , are officially multi use paths. In Alaska they’re called non-motorized pathways. 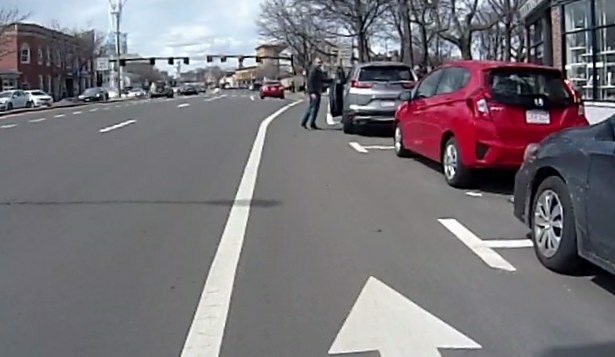 The OP says ""road salt and auto parts are collecting in their bike lane", so the OP was referring to the "bike lanes" on the sides of auto roads, not the non-motorized multi-use paths (MUPs). Yes. And the big joke in the city of Pittsburgh is that the bike lanes are maintained better than the streets for motorized traffic. Often the bike lanes are cleared of snow before the motorized vehicle part of the street. It is really funny sometimes here in Lincoln. The Parks Dept take care of our 130 miles of bike paths, and get them plowed of snow quite fast in the winter time. The Street Dept of course does the streets, and are sometimes not quite so fast. Some drivers complain about the fact that they see clean trails while they are slip sliding on snow covered streets. My town barely has footpaths let alone luxuries like bike lines! Portland is all over the place. From much like the stories above to the Terwilliger Pkwy where the decently wide bike lane gets swept regularly (every week in the fall; I used to see the sweeper out there very late Wednesday nights on my swingshift ride home). The bike lane close to my house was for a few years painted wet-slippery blue as it passed the old road the new replaced. The new road swings left. The lane is slightly off camber and in the middle of the intersection/apex of the turn, both graveled year 'round and off camber. A few years ago they "corrected" the paint problem by running on of those pavement strippers over it, leaving it deeply grooved in ready for pavement mode, then painted the ridged lane in green. I don't expect any change until they repave the street, probably 5 years away. Oh, the off-camber, rough pavement and gravel happens just as you cross in front of cars waiting at the stop sign. Really confidence inspiring. (Not!) The city paid real money to go out of their way to make that 20' of lane that bad. um, sort of, yes & no? I'd say they are maintained about as well as the roads themselves. Mostly the city does a descent job, but debris are present everywhere. It does remind me of a time when they redid a road and added bike lanes. However, they didn't clean up the construction mess and the bike lanes where full of little stones and assorted crap. I said to myself "how thoughtful, it is already has debris preinstalled".